Well, the hardreading staff kind of saw this coming. Back in June, we posed the question Is Sebastian Smee Jumping to the New York Times? 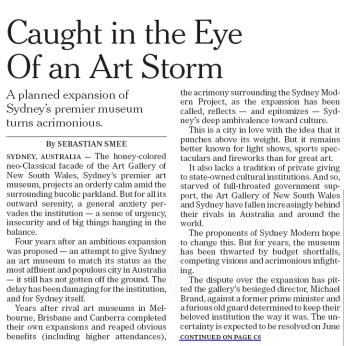 based on this piece that the estimable art critic wrote for the Times Arts section. Turns out we got the jump part right, just didn’t stick the landing. We are delighted to announce that Sebastian Smee, the art critic of The Boston Globe, will be joining The Post in January as an art critic. Hiring Sebastian represents an expansion of The Post’s fine arts coverage. He will team with Philip Kennicott to review major exhibits nationwide and report engagingly on the art world for a wide audience. Phil becomes the senior art and architecture critic and will also continue to write cultural criticism. According to the Post’s press release, Smee will work for the paper from Boston starting January 8. Here’s another date to consider: November 8. That’s the dateline for the Post announcement. But there’s been no mention locally of Smee’s move – which is major, both for the Globe and the Post – until now (it first appeared in a tweet from @FortPointer on Sunday). P.S. 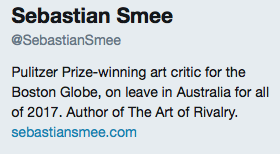 Smee still has this profile on his Twitter feed. As the hardreading staff has noted on numerous occasions, the Boston Herald has consistently failed to grasp the distinction between news and promotion. Exhibit Umpteen: Today’s edition of the selfie local tabloid, which devotes half a page of its ever dwindling newshole to a talk Herald columnist Adriana Cohen gave yesterday at a Harvard student conference. That’s rich, given that Cohen – a charter member of the Trumpettes – has demonstrably never met a knee she wouldn’t jerk. Just as the Herald has never met a PR event it wouldn’t dress up as news. To be fair, the Boston Globe has lately done its share of self-promotion as well. 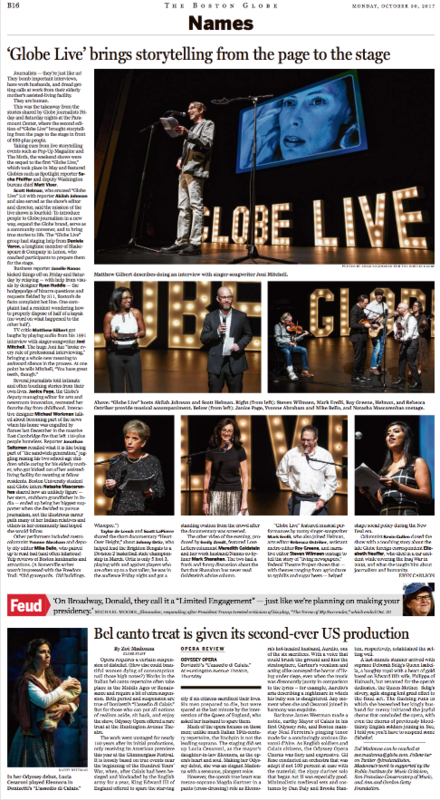 There was all the hubbub in the newshole last month over the paper’s HUBweek festival, and this wet kiss for “Globe Live” in the Names column last week. Never say we don’t give you both sides. You are currently browsing the It's Good to Live in a Two-Daily Town blog archives for November, 2017.